There have been some movements in an electorate that is becoming reluctantly engaged in a now month-old campaign that they are loosely acknowledging. 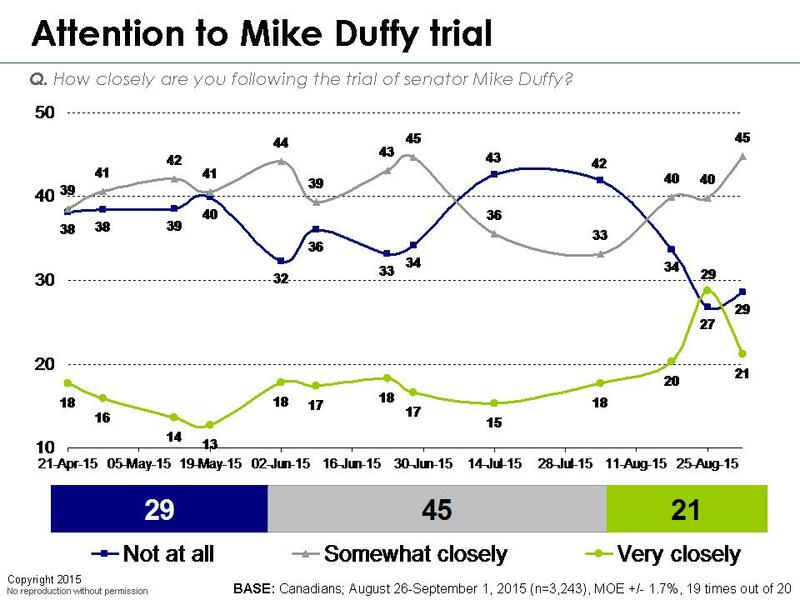 If there was a sense that the Duffy scandal was beginning to awaken voters and weigh down on the Conservative fortunes, that sense has pretty well evaporated over the past couple of weeks. 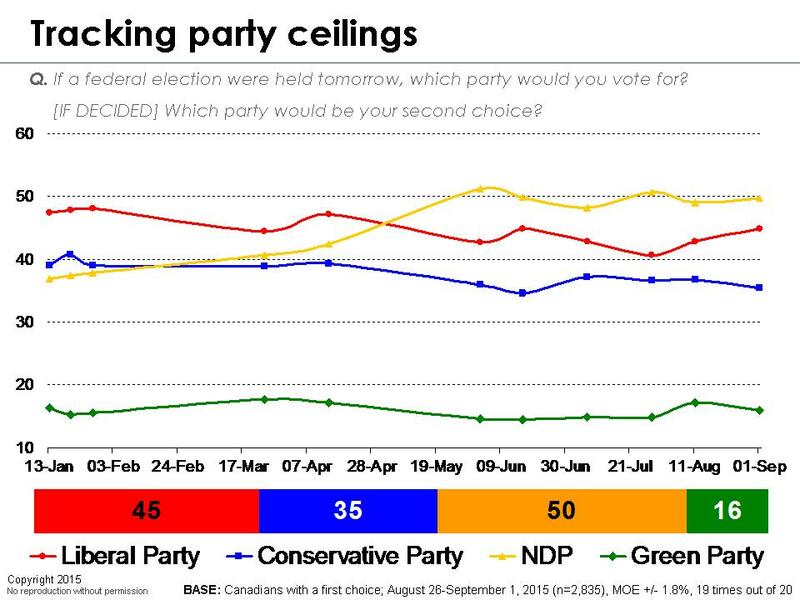 Attention deficit disordered voters appear to have at least temporarily moved on and the Conservatives now find themselves in a three-way tie with the NDP and Liberals. In what has been a familiar dance, promiscuous progressive voters have been shifting again. This time, the movements clearly favour the rejuvenated Liberals who have moved up by about as much as the NDP has moved down. These movements reflect the most fluid group in the electorate but they also leave Stephen Harper’s constituency intact. 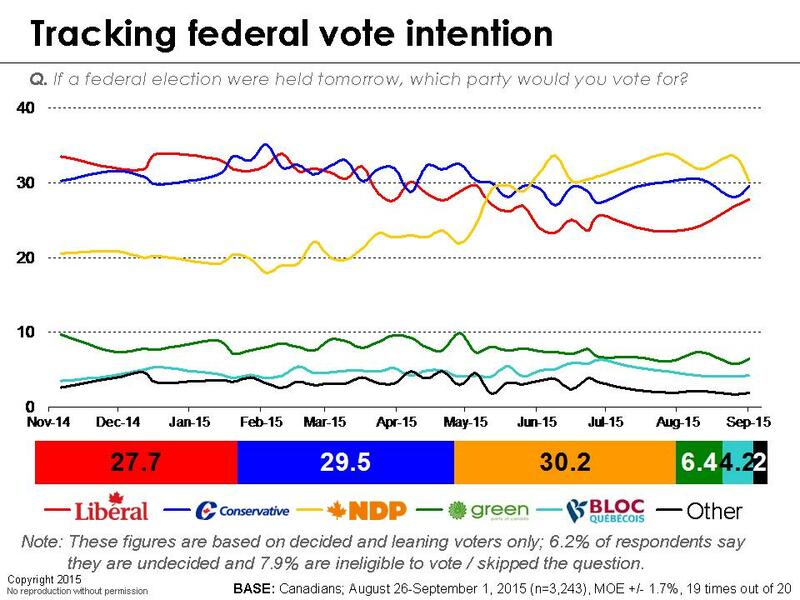 Ironically, this is probably increasing Harper’s prospects of re-election, precisely the opposite of the goal of those voters casting back and forth across the NDP and the Liberal Party in search of an antidote to Harper rule. This dynamic is no more vividly evident than in Ontario where Conservatives will be direct beneficiaries of a futile split of NDP and Liberal voters who share a higher order goal of displacing the incumbent. In recent weeks, the NDP has fallen back just about everywhere except Quebec, where they remain the dominant party by a huge margin. The Bloc Québécois has lost whatever momentum they briefly picked up upon the return of Gilles Duceppe, but they are still hanging around and are not out of the game yet. The Liberals now find themselves on the winning end of what is a tight, three-way race in Ontario and Atlantic Canada is looking increasingly positive for them. Alberta and Saskatchewan remain safely in the hands of the Conservative Party. The NDP seems to be losing traction with seniors, while the Liberals are clawing back some of the university vote they lost to the NDP. 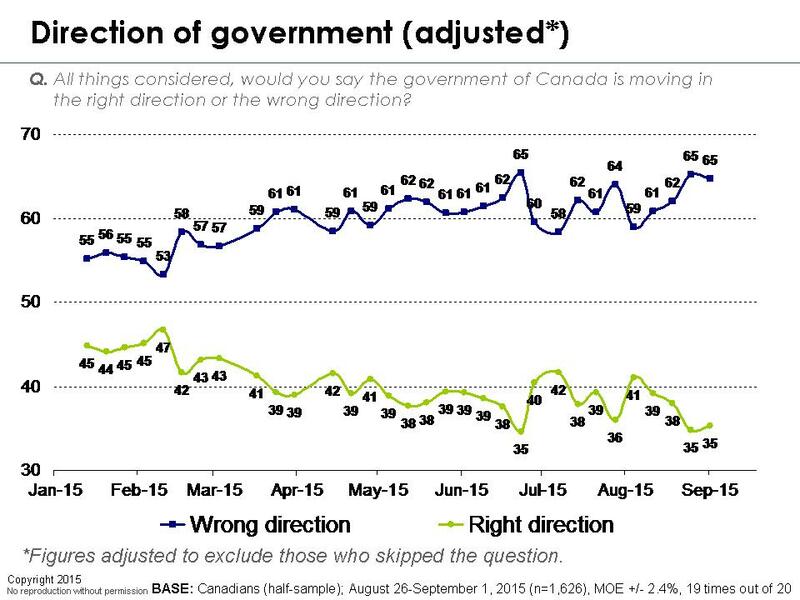 The numbers on direction of country and government are largely unchanged, although the gap between NDP supporters and other constituencies in terms of federal direction has disappeared. 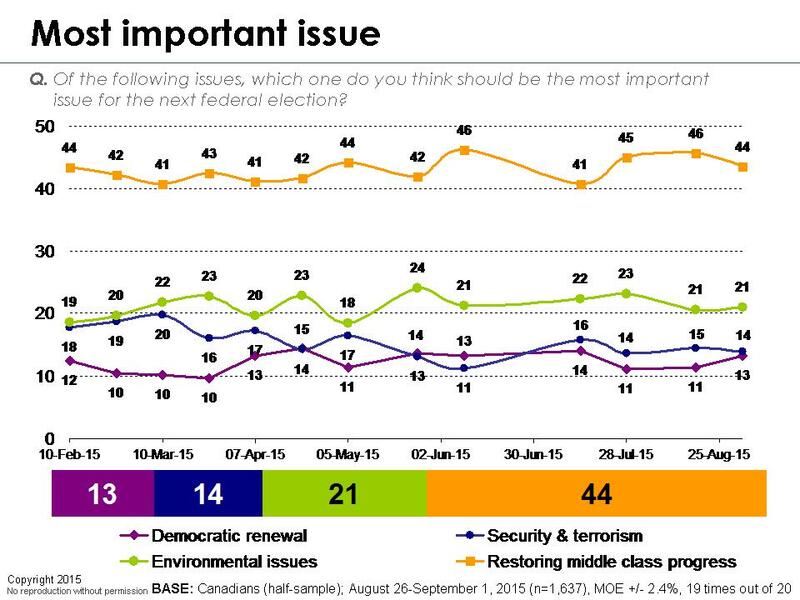 In short, the NDP is no longer a rallying point for disgruntled voters. So why are some progressive voters shifting back to the Liberals? Before we answer this question, it is important to understand where Canadians stand in terms of their most important issue. First, we will try and refine what we think is on the minds of Canadians when they think about the economy; it’s really quite different than the media narrative and none of the parties have provided a convincing answer, yet. 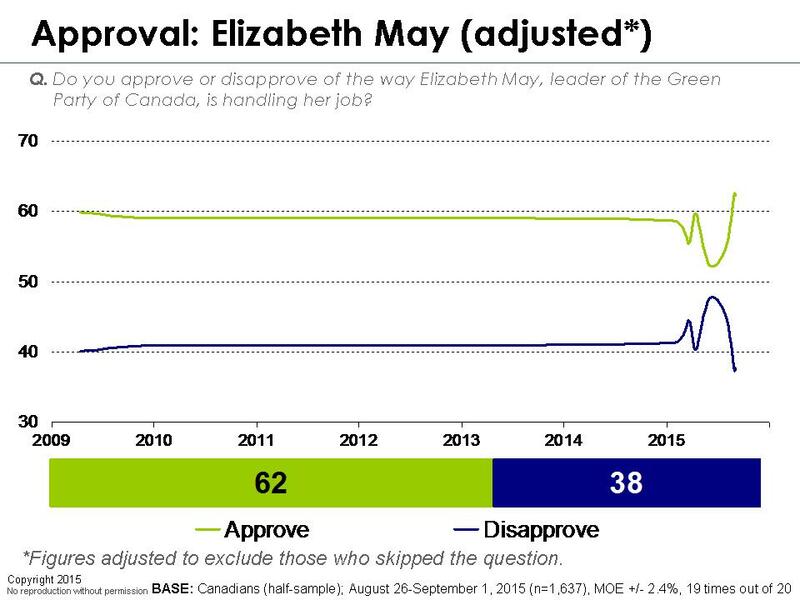 It is important to note the radical disconnect across the relatively sanguine and mirthful account of the economy coming from Mr. Harper (‘envy of the G7’) and the jarringly different world that voters, consumers, and workers live in. 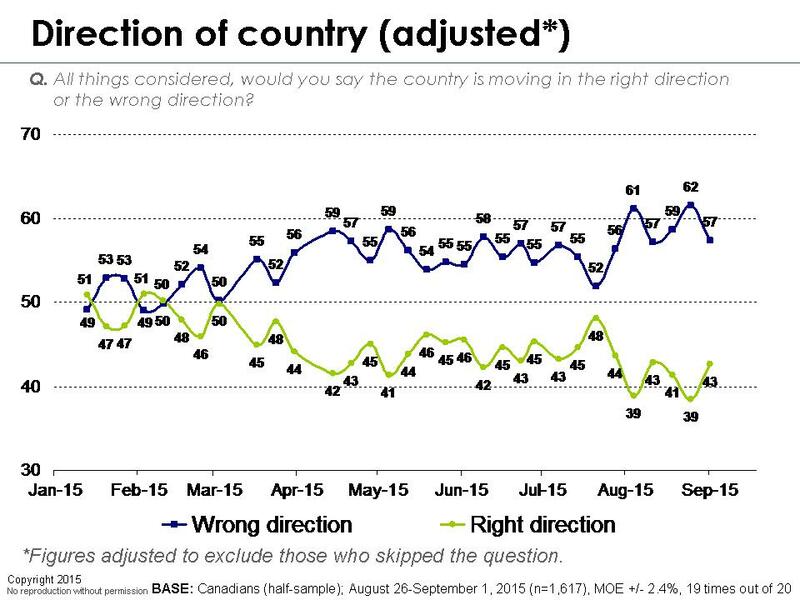 For some time, a huge majority of Canadians have felt that we are in recession. As the official statistics catch up to the wisdom of crowds we also note that arid discussions of what type, how serious and whether we are in recession at all may be grist for the media and punditocracy, the positive economy is risibly preposterous to what most Canadians are experiencing and feeling. It is also not simply whether we have entered a recession, but rather a deeper concern that it comes on the heels of an unusual and protracted period of very tepid growth where most of the meagre pie has been going to a small sliver at the top of the heap. Moreover, this sense of stagnation – and, for many, decline – is less troubling than the even darker future Canadians see for themselves and their children. Granted, this dark picture is much brighter for the Conservative base, but the overall economic mood is very bleak indeed. The concerns do not simply or even mostly concern the immediate issue of the R-word. The broader concerns are a deep anxiety that progress and the middle class bargain are broken. It is these daunting issues that Canadians want dealt with and for most available progressive voters, a balanced budget is a much lower priority than investments in new measures to grow the economy. Clearly, the economy and restoring middle class progress are the dominant issues (by far). 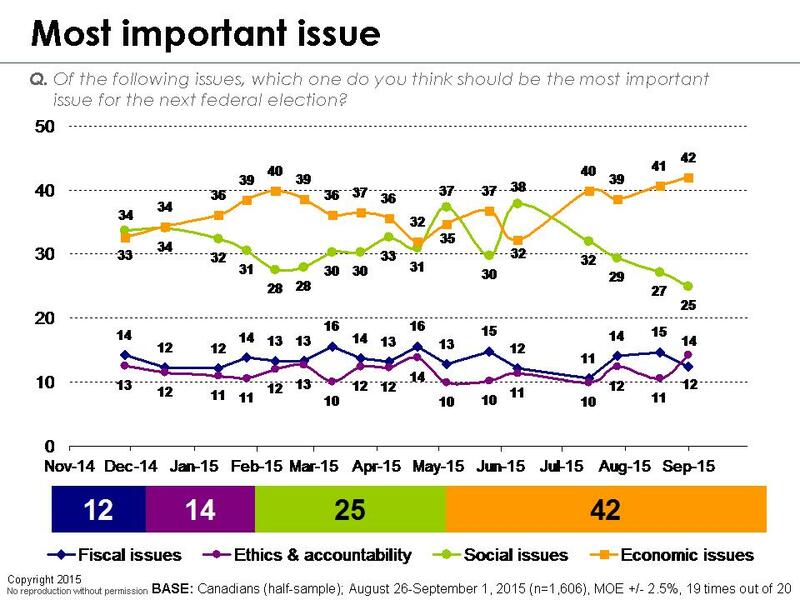 While no party has ownership of these issues, it is notable that public favour is shifting from NDP to the Liberals. 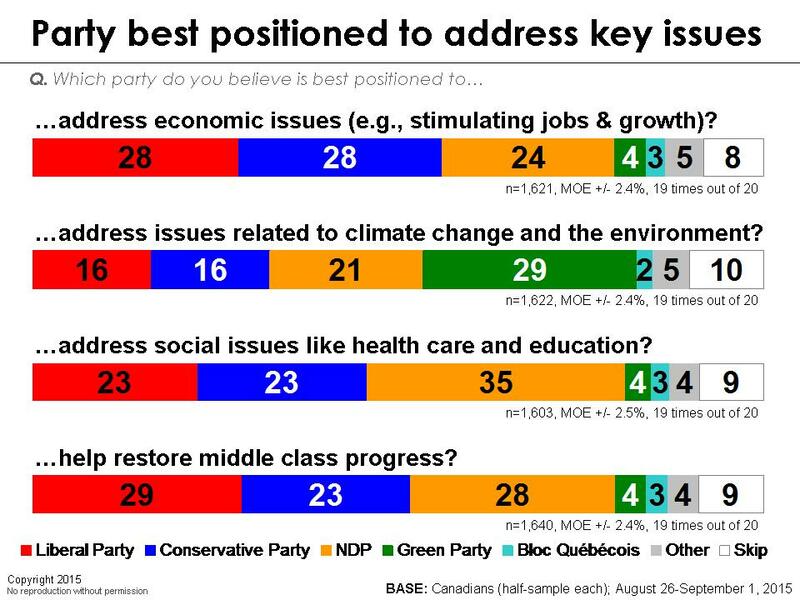 The NDP still retains a commanding lead on social issues, but these issues have waned in importance amid growing economic uncertainty and unless the NDP can link these issues to economic well-being, their advantage in this area will do them little good on Election Day. These movements – along with his improved standing on both approval and vote intention – suggest that Justin Trudeau has helped himself with his proposed deficit-funded infrastructure spending program. Thomas Mulcair, meanwhile, seems to be hurting himself with his promise of a balanced budget, suggesting that Canadians are leery of focusing on fiscal rectitude – rather than kick-starting the economy – when middle class workers have not seen a real wage increase in years. Furthermore, concerns with fiscal discipline are largely concentrated in the Conservative camp, which is largely unavailable to the NDP. At best, Mr. Mulcair may be making himself mildly less objectionable to those who won’t vote for him and ignoring the preferences of his available constituency. While we understand the importance of signalling fiscal prudence, the NDP may want to consider the potential fall-out more carefully. 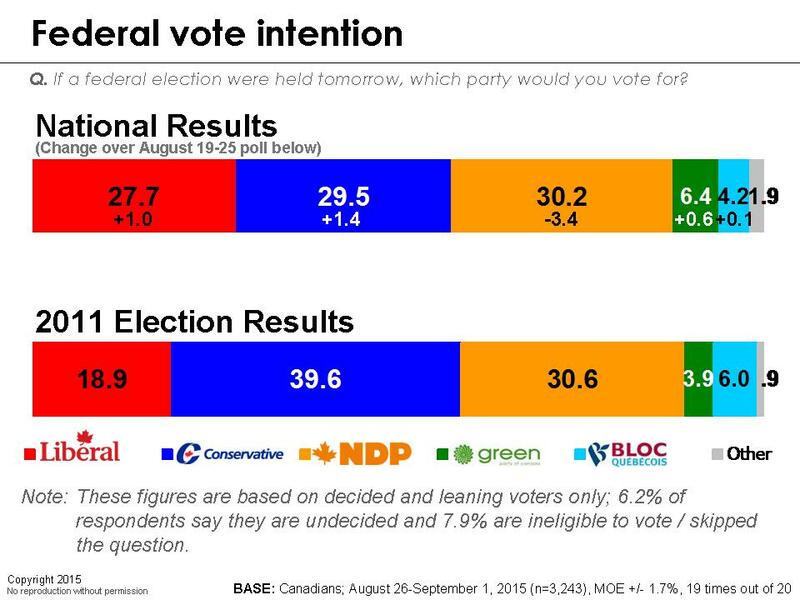 As we mentioned earlier, virtually all of this week’s movements have occurred with the ‘promiscuous progressive’ segment of the electorate or, rather, those voters who express ambivalence between the Liberals and NDP and are predominantly focused on a change in government. 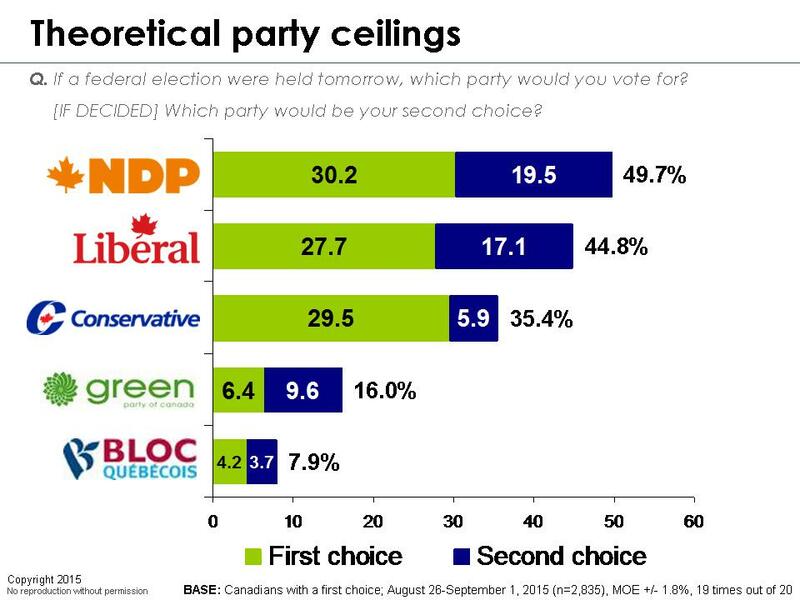 Looking at second choice, we see that Liberal gains have led to a corresponding rise in the percentage of Canadians choosing the NDP as their second choice. In the end, neither party has seen a net shift in their potential vote ceiling. These results once again underline the challenge of the centre-left continuously cannibalizing its own vote in search of gains. While voting splitting among the centre-left certainly benefits the Conservative Party, these results also highlight the challenges faced by the current government. While the party is the first choice of nearly 30 per cent of eligible voters, they have almost no room to grow. 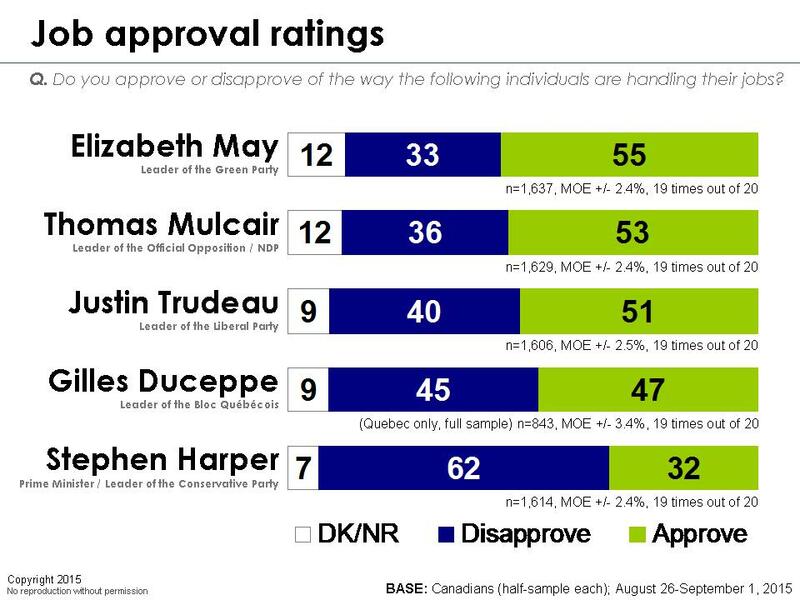 Indeed, just six per cent of non-Conservative voters would consider casting a ballot for Stephen Harper, giving the party a potential vote ceiling of 35 points – well short of what is generally considered the minimum threshold for a majority government. With the trial on break until November, the Duffy effects that seemed to be weighing down Conservative fortunes have largely dissipated. It is the economy that now looms as the master issue for a public who saw this recession clearly some time before the ‘official economy’ has anointed it with the R-word. 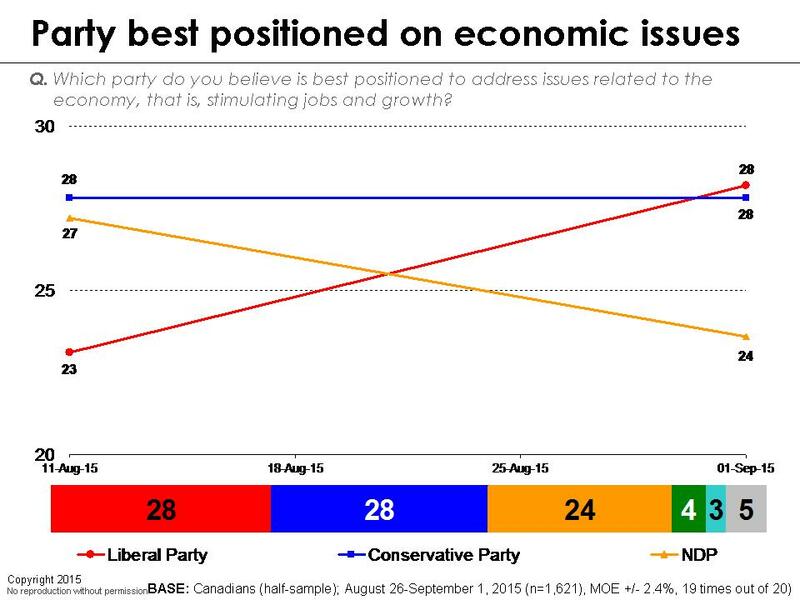 At this point, the economy is largely eclipsing all of the other major concerns that Canadians hold. The field dates for this survey are August 26-September 1, 2015. In total, a random sample of 3,243 Canadian adults aged 18 and over responded to the survey. The margin of error associated with the total sample is +/- 1.7 percentage points, 19 times out of 20.